Because of its size and growth, the Nong Suea Church is in need of its own church building. So far, we have raised $5,247.00 for this building ($25,000 is needed to purchase the property), we have set all monies aside and have not sent anything to Thailand at this time. 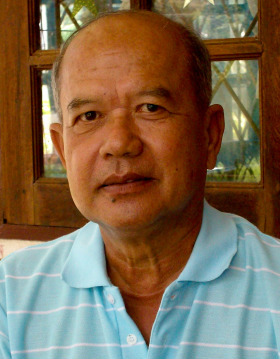 All funds raised are reserved for the Nong Suea church building. Although there is a hold on the purchase, JSMI supports the Nong Suea church on a monthly basis. Currently on the Homefront, JSMI has entered into a season of growth and expansion. We have needed to find a new office location for our ministry due to limited space, and we have recently found the ideal place. -God is so good! This move is the biggest thing our ministry has ever done; therefore, all our efforts have been to raise the funds necessary for this move. Our new ministry offices will enable us to increase our ability to win more souls, to grow our internship program and to train people in world evangelism. If you would like to know more about this unfolding miracle, see the videos and details on our webpage. 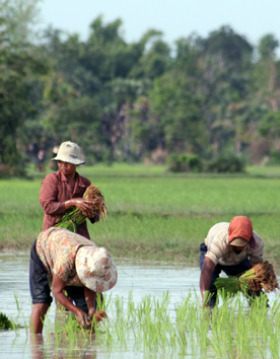 We rejoice together seeing over 140,000 salvations in Thailand since the inception of the Thailand Harvest Plan! Thank you for being part of this Harvest Plan! We will keep you updated on all developments concerning the building for the Nong Suea church. We so appreciate your eternal investment in the country of Thailand! This lady is the daughter of one of our church members. She had rejected God but when she had a stroke, she was suddenly interested in this God that could heal her and she received Christ. This last Sunday, Pastor Bob picked her up for church. She listened to the message and was encouraged. She seemed to have a genuine hunger and love for God. A new believer in Nong Suea named Jamnuan Junmiwang, had an accident leaving her left hand partially paralyzed where she could not use her hand or fingers to pick up anything. This accident actually caused the right side of her brain to not function correctly. Her entire left arm and hand was almost completely nonfunctional, and as a result she could only lift her left arm a little bit. A miracle happened when hands were laid on her in the name of Jesus. 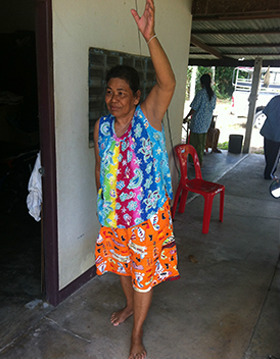 After Pastor Kit finished praying, Jamnuan did what she couldn’t do before. She lifted her hand well above her head! Pastor Kit gave her a Bible, which was quite big and heavy, and she was able to grab it and lift it high! She lifted it higher than her head! Jamnuan was in tears with joy for God’s love and grace. She comes to the church every week; she never misses. She rides her bike around 3 to 5 miles one-way each Sunday. She also brought one of her relatives to receive salvation as well. Now, they both come to church together! 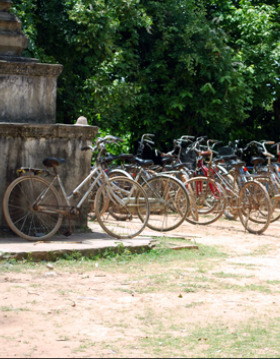 They each ride their own bike and they arrive before all the other church members. The church members of Mahachai are very dedicated and love the Lord. One of the church members, who had financial problems, took the initiative to start selling rice soup, which is a very traditional quick breakfast. She sets up every morning right in front of the church. She actually sells out every day well before the other vendors! She gives all the glory to God and also promotes people working hard while trusting God for answers. This lady shares her faith openly and has led many to Christ. She is also someone that gives to God’s work on a regular basis. Mrs. Rung is the wife of an influential police officer. 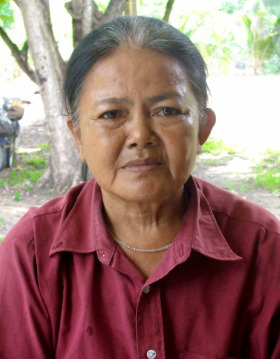 At first, she has had to sneak out of her house to attend the church in Mahachai, since her husband forbade her to go. After much prayer, God has changed his heart and he now allows the family to attend. Mrs. Rung is a hungry student of the word and never misses church, or Bible Study sessions unless she is out of town. Her 4-year-old daughter sang during praise and worship just a couple of weeks after being saved and knew all the words by heart! Every year, several of the teens from our churches go to church camp conducted by our leaders. While there, they are ministered to and trained in the fundamentals of ministry. These teens have also traveled with Bob Scott to other regions of Thailand to testify of their faith and share the Gospel. The believers are trained ‘hands on’ to win the lost and pray for the sick. These teens have become some of our best leaders in our churches. This precious 76 year old man (pictured at left) fought in Vietnam for the Thai military and was a soldier for 40 years. For more than 10 years, he had serious hearing problems in both ears as a result of bombshells and other loud noises that he endured as a soldier. His hearing was continuing to deteriorate. He went to hospitals and there was nothing they could do for him. His friends (even his pastor) said they would have to yell (standing right next to him) in order for him to hear, and still sometimes he was unable. 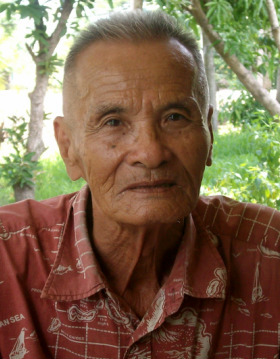 His wife first came to our church in Nong Seua. She had major bladder control issues and would often become dizzy. God miraculously healed her! Now he had visited the church before but didn’t really feel a need to come. After seeing the miracles in his wife’s life, he began to attend. 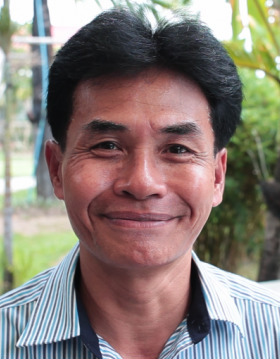 During a mini-crusade JSMI held (at the church in Nong Seua) in June, he was completely healed; his hearing was restored! He said he went to the hospital and his health was fine. He said that God working in his family is what caused him to change. He said he loves God so much and promised God that he will come to church every Sunday, until he dies! He is very bold to tell others of all God has done and continues to do in his life. she has no more pain and doesn’t take any medicine now. People who know her are amazed at the change. She boldly tells them Jesus healed her! She also shared a few more testimonies. One day recently she was working at her job selling noodles and she spilled a great deal of hot water on her arm and absolutely nothing happened. No pain, no scarring, nothing. Once again, proof to those who saw that God is real and powerful. 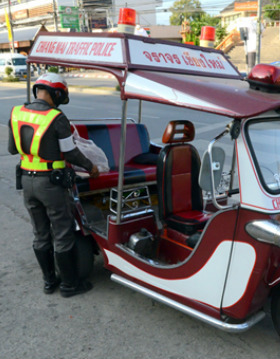 Her grandson lives in Bangkok and she prays regularly for his protection. He had a wreck while making a u-turn and he or his car weren’t damaged. He drove away completely fine. Her granddaughter lives in Los Angeles and had severe aches in her joints. She prayed for her granddaughter and she is completely healed. She says that if she is missing anything or needs anything from God, she prays and it comes. She was smiling as she spoke of the goodness and faithfulness of God! This 64 year old man had hearing problems in his right ear for 20 years. He came to JSMI’s mini-crusade in June hosted by the church plant in Nong Seua. When John prayed for everyone who needed healing, this man put his hand on his own ear and believed God. He had his hearing tested and it’s completely normal! We’ve visited him twice since the crusade, and he’s totally healed! He was very happy and kept explaining over and over that Jesus healed him. He says he will serve Him for the rest of his life! He is a faithful attendee at the church in Nong Seua, located just outside of Bangkok. Three months of exceptionally heavy monsoon rains have left 427 dead, 15 districts under waist-high water, and 2.2 million people affected. Several of our churches are in districts still under water. The damaged dike/dam system means these conditions could last longer than a month! 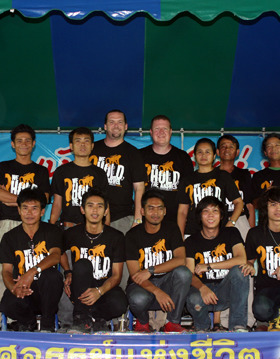 John Smithwick was with Pastor Bob Scott in Thailand the week of October 20th for the THP’s 5th Church Camp. Eighty new believers planned to attending the yearly 2-day THP camp for water baptism, but flooding prevented many. Still, 40 new believers forged through the flooded streets to attend and be baptized!